Artificial intelligence is being used to improve the efficiency of online customer service in all kinds of ways, from chatbots to auto-replies, but a new startup is aiming to use it in call centers too. Unfortunately, the aim of the technology appears to be to improve sales rather than smooth over disputes. Afiniti International Holdings believe that caller experiences could be improved by matching them to the right customer service assistant and it’s using AI to make this happen. When someone gets in touch with a call center through the Afiniti technology, the AI system builds a profile of them, combining a history of their purchase and contact history with any public information from their social media profiles. It then rounds out the profile with information gathered from the census archives of the caller’s area. As the system will already have information on its associates, it will attempt to match an associate with callers similar to those they’ve successfully helped and sold to in the past. As everything is done in the background by the AI system, Afiniti says the customer service assistant won’t have access to any of the personal information gathered about the caller and neither will they know exactly why they’ve been matched to the person they have. As you’d expect, this has raised some concerns with regards to customer privacy. According to The Wall Street Journal, Afiniti has stated that it only pulls its data from databases where information is legitimately available for purchase, such as credit firms like Experian, and will only use data from social media profiles that’s been made public by the users themselves. However, a digital marketing professor at the University of Pennsylvania told the WSJ that the use of the technology was a "process of discrimination" and that companies bringing together data of which we have no knowledge could "discriminate against us in a prejudicial sense or a positive sense, depending on who we are." Afiniti has already installed the technology in 150 call centers for a variety of clients. 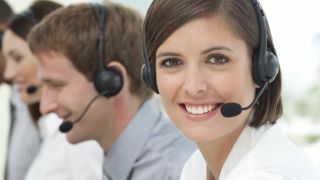 So if you ever make a customer service call and find yourself talking to a sales associate with whom you have an uncanny connection, maybe consider it wasn’t fate that brought you together.